It’s a common question – can yoga help me loose weight? And the simple answer is YES. Yoga helps you to bring your body into balance and a regular, consistent yoga practice (ideally several times a week) will see you achieve benefits like shedding a few kilos and increasing muscle tone. The basics to losing weight are easy: move more, eat less. Yoga can help you change both physically and mentally. A regular practice gets your body moving and burning calories while the spiritual side of yoga can encourage you to address any eating and weight problems on a deeper level. So what is yoga for weight loss? There’s a number of factors at work when you practice yoga. A recent American study indicates that muscles respond to stretching by “becoming larger, extracting and using more oxygen more quickly and efficiently”. To put it simply – while you’re stretching you’re also building muscular strength and endurance, making you fitter! Other studies suggest that yogic breathing techniques help increase lung capacity, in turn improving flexibility through the torso, shoulders and back, allowing the lungs to expand more fully. If practicing an vigorous style of yoga (Such as Vinyasa or Astanga), you can boost your heart rate into the aerobic range. These styles increase the heart rate and encourage weight loss. Anyone who’s practiced a powerful class of continuously linked poses will know you can get your blood pumping and sweat dripping in a yoga class! With that said, there’s a number of yoga postures that don’t get your heart rate up but can still improve cardiovascular conditioning. Many yoga poses, especially standing, balancing and inverted ones, build quite a bit of strength because they require sustained isometric contractions of many large and small muscles at once. And if you hold the poses longer, this increases the effect. Studies have found that yoga practice lowers the resting heart rate, increases endurance, and can improve your maximum uptake of oxygen during exercise—all indications of improved fitness. Successful weight loss isn’t just about the physical, there’s the mental aspect too. In fact, these deeper aspects of yoga could be the most potent for weight loss. Yoga helps us to unwind, lowering the hormones that are released when we’re stressed – unfortunately a constant state for many of us! Studies have shown that when we’re stressed out, angry or upset we can engage in “food-seeking behaviour”. Most of us don’t make sensible food choices in these situations and will reach for chips over an apple. The body takes in these extra calories and distributes them as fat in the abdomen, contributing to weight gain, increasing our risk of disease. Yoga could inspire you to become a more conscious eater, choosing healthy, natural foods while helping to understand when and how much to eat. Pay attention to your body’s signals on the yoga mat, and distinguishing these from your thoughts and emotions, can help you listen to your intuition in other moments of your day. Poor food choices, opting for convenience over nutrition often contribute to weight gain. Becoming aware of the present moment and practicing mindfulness will help you to enjoy every bite of your food that you take creating a sense of fulfilment, instead of grabbing anything on the go leaving yourself feeling unsatisfied. A lot of people credit yoga as helping spark changes in life – as well as helping maintaining these changes. The ancient yogis use the word, “tapas” (Sanskrit for “heat”) which refers to the fire, discipline and dedication that fuels yoga practice. This principle can extend from on the mat to off the mat to overcome dullness and change negative, self-sabotaging habits. You may notice that with a consistent yoga practice you may start to eat better, exercise more, or are finally able to keep excess weight off after previous failed attempts – even without making a conscious effort to do so! 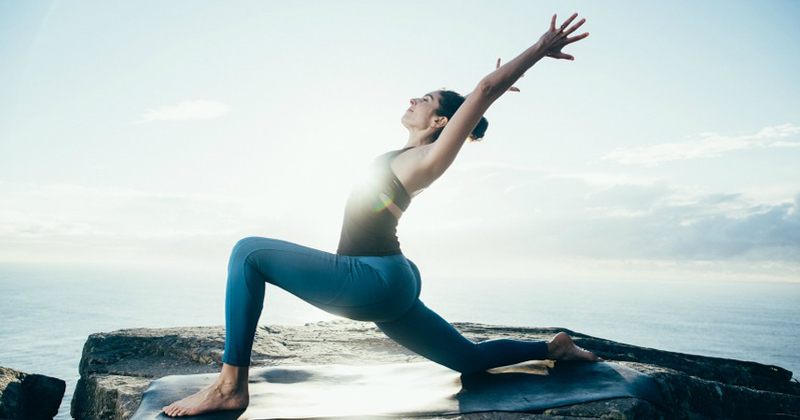 If you’re looking to get physically and mentally fit, make sure your yoga practice includes a mix of postures that build strength, stamina, and flexibility, along with breathing and meditative techniques. Find a class near you on our timetable or check out YOGAHOLICS for access to yoga for weight loss (or any other reason!) any time, anywhere! As with any activity, remember that commitment and consistency is key!